We’ve all been there. It’s the middle of the afternoon and we’ve been working at something furiously – concentrating intently on one thing for much longer than we should. 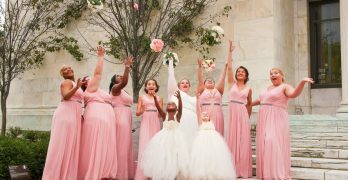 Sometimes frustration, confusion, or stress tries to rear its ugly head, and in those moments, we need a mental break – a moment where we can step away and think about something else. With the new Cranium Brain Breaks game, whether you’re 8 or 88, you have a fun and engaging new way to take “brain breaks” with your friends, family, or co-workers. Got a minute? 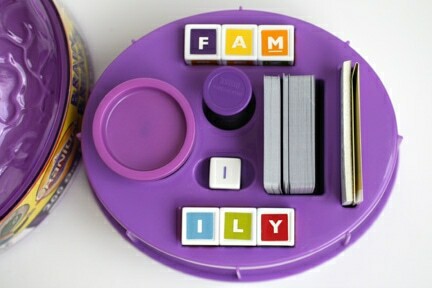 That’s all you’ll need to play one of the two hundred games in the all-new Cranium Brain Breaks. This game is perfect for those few spare moments in the day when you don’t have time for a full game, but have a couple minutes for fun before the next scheduled activity. Each of the 200 different games can be played in 60 seconds or less and is stored in a compact purple brain-shaped case. I was excited when I opened up our copy of Cranium Brain Breaks. First off, the packaging is incredible creative. The bright purple container is covered with a very cool brain-shaped lid. The game comes with 100 playing card (double-sided which means you have 200 games,) six Cranium cubes, 1 die, a 1 minute time, Cranium clay and a notepad. Each item has it’s own designated spot in the brain container to make sure you don’t lose any pieces and everything is nice and ordered. Playing the game is super easy. Gather your friends and family together (they recommend 2-6 players) and get ready to have some fun. The game starts off with drawing a playing card. The player reads the instructions on the card, and then the group plays together to accomplish the task within 60 seconds. Tasks can range from Hangman type games to drawing guessing games. 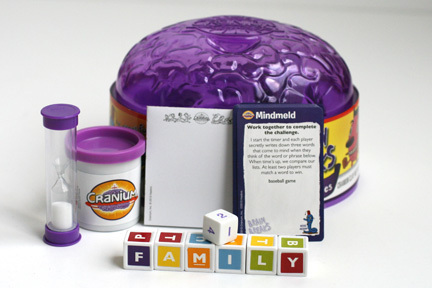 There are word puzzles (like naming three words for a specific topic and having to match with other players) and sculpting challenges using Cranium clay which are from familiar Cranium Categories: Creative Cat, Word Worm, Star Performer, and Data Head. Cranium Brain Breaks is so much fun to play. Since each mini game is just a minute long, you can easily control how long (or how short) you want to play. 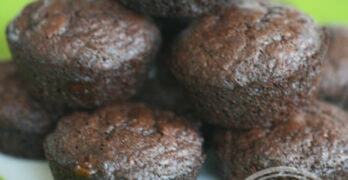 This can be a fun afternoon break for both kids and adults! If the kids need a quick break from a hard study session or if you need a quick break from too much time at the computer, then just pull out the purple brain for some creative fun in minutes. Cranium Brain Breaks is arriving in retailers nationwide this fall for just $14.99. 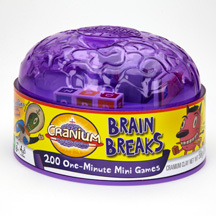 You can also purchase Cranium Brain Breaks online on Amazon for just $12.96! This is a great holiday gift idea (yes…it’s getting to be that time again) for both your kids and maybe even co-workers! This giveaway ended on October 19, 2011 and is now closed. We would take brain breaks of family games instead of vegging out with the wii. I love Cranium!! Enter me please! Thanks for the chance. We take brain breaks while in the car. We watch a funny show for a brain break. We have never play Cranium before, it sounds like fun!!! I love Cranium games. Enter me please! we take brain breaks by going hiking. We also play lots of board games, but we typically take our brain breaks in the bubble bath!! We usually forget to take brain breaks so this would be a fabulous prize!! We don’t take many brain breaks this game would be perfect for it. We take brain breaks by playing Words with Friends! Just getting up and shifting positions or the task at hand is how we take a brain break at the moment. We take brain breaks by pretending to talk like the dogs a couple times every day 🙂 Thanks for the giveaway! We laugh together as a brain break. I have a 2 yr old so we do a lot of playing outside and walking our dogs. We take breaks by going walking. We go outside and play for a brain break. I love playing board games for a brain break and would love to add this game to the mix. We take brain breaks by creating art! We either bike ride or take walks on the trail. We take brain breaks by taking the dog outside to play frisbee. We take brain breaks just by being silly and laughing a lot. brain breaks… hmmm well I like to tinker with cars. My wife loves bubble baths, and the boys love to play!!! We like to go for long walks. We take brain breaks by watching movies! Thanks so much for the fantastic giveaway! I dig the Cranium games! I hope I win! We take brain breaks by watching the sunset at the local beach. We like to go bike riding together. We have family friday every week! Movie watching and popcorn. e take brain breaks a few hours before bed, so we can sleep soundly. We have family night once of month where we eat a bunch of junk food, drink alot of soda and watch a fun movie! We listen to music or go for a hike! My son and I enjoy watching cartoons together for a Brain Break. We turn on the music and take turns changing the lyrics around into something funny. We take ‘brain breaks’ by going outside and playing. We go for walks at a local park. We take brain breaks by going out and shooting hoops. We go to the lake.